« YOU DON’T KNOW JACK…..
Theodore Robert Bundy (November 24, 1946– January 24, 1989) American serial killer active in the 1970s (and highly likely 1960s as well). 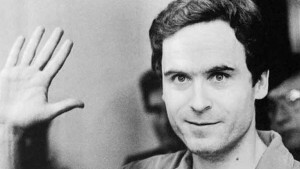 Of all the modern day serial killers Ted Bundy is the one that most people think of. I think this is because he proved to the world that serial killers are not a ugly boogeyman, with boils and walking with a limp. He was not just a normal looking person, he was attractive, intelligent and charismatic. However underneath he was cruel, sadistic and a pathological liar. Now Bundy was a prolific Serial Killer and the number of his victims is often argued. It is generally accepted that he killed 35 people (of which 10 remain unidentified). However there could be many more. He defiantly committed murders in at least 7 states in the US from 1974 – 1978 (for his confirmed victims) but he was most likely active in the 60s also. However it is very likely that he started his killing much earlier back when he was a teenager. He told different people different stories about his murders but he did mention murders prior to 1974 on numerous occasions. His victims were all female and youngest (confirmed) victim was 12 years old and his eldest was 26. He tended to prey on college campuses and many of the women had a resemblance to the ex girlfriend who had broken up with him. He would approach women with his arm in a sling and ask ask potential victims to help him carry things (like books) to his Volkswagen Beetle. January 4th 1974: Karen Sparks (18) – at about midnight Bundy entered the basement apartment of Sparks (a student at University of Washington). She was beaten and sexually assaulted with a metal rod taken from her bed frame. Sparks survived but had extensive internal injuries and permanent brain damage. February 1st 1974: Lynda Ann Healy (21) – Bundy broke into Healy’s (a University of Washington undergraduate) home. She was beaten unconscious then dressed her and abducted her. Her skull and mandible were recovered at Taylor Mountain (one of Bundy’s dump sites in Washington). March 12th 1974: Donna Gail Manson (19) – Manson (student at Evergreen State College in Olympia) left her dorm to go to a concert on campus but never arrived. Her body was never found but according to Bundy her body was left at Taylor Mountain site. April 17th 1974: Susan Elaine Rancourt (18) – Rancourt disappeared after attending an evening advisor’s’ meeting at Central Washington State College. Her skull and mandible were recovered at Taylor Mountain site. May 6th 1974: Roberta Kathleen Parks (22) – Parks left her dorm (at Oregon State University in Corvallis) to go and meet her friends but never arrived. Her skull and mandible were recovered at Taylor Mountain site. June 1st 1974: Brenda Carol Ball (22) – Ball disappeared after leaving the Flame Tavern (in Burien). She was seen in the parking lot talking to a man with a sling on his arm. Her skull and mandible were recovered at Taylor Mountain site. June 11th 1974: Georgann Hawkins (18) – Hawkins was abducted from an well lit alley behind her sorority house (at UW). Witnesses saw a man on crutches with a cast on his leg asking women to assist him carry a briefcase to his VW Beetle). Her skeletal remains recovered at the Issaquah dump site (another of Bundy’s dump sites near Issaquah, Washington ). July 14th 1974: Janice Ann Ott (23) – Ott was abducted from Lake Sammamish State Park (near Seattle, Washington) in broad daylight. Several women said that they had been approached by a man calling himself “Ted” with is arm in a sling. He asked them for help in unloading a boat from his VW Beetle. The same man was seen approaching Ott and she left the beach with him. Her skeletal remains were recovered at the Issaquah dump site. July 14th 1974: Denise Naslund (18) – Naslund was also abducted from Lake Sammamish State Park 4 hrs. after Ott. She went to go to the rest-room and never returned. Bundy later confessed that when he returned with Naslund that Ott was still alive and one was forced to watch the other be killed. Her skull was recovered at the Issaquah dump site. September 2nd 1974: Unknown Hitch-hiker (?) – According to Bundy, he raped and strangled a unidentified hitch-hiker in Idaho and disposed of her body in a nearby river. October 2nd 1974: Nancy Wilcox (16) – Wilcox was ambushed in Holladay, Utah and dragged into a wooded area. She was raped and strangled then (according to Bundy) her body was buried near Capitol Reef National Park (south of Salt Lake City, Utah). However she has never been found. October 18th 1974: Melissa Anne Smith (17) – Smith (who was the daughter of the police chief) vanished from Midvale, Utah after leaving a pizza parlour. Her body found in nearby mountainous area 9 days later. She had been beaten, raped, sodomized and strangled with stockings. October 31st 1974: Laura Ann Aime (17) – Disappeared from Lehi, Utah. Her naked body was discovered by hikers in American Fork Canyon, Utah. She had also been beaten, raped, sodomized and strangled with stockings. November 8th 1974: Carol DaRonch (18) – DaRonch was at a book-store in a mall when a man approached her and identifying himself as “Officer Roseland”. He told her someone had tried to break into her car and she accompanied he outside to find nothing had been taken. He insisted she come to the station to file a report but she became suspicious when she saw he was driving a VW Beetle. She asked to see his ID and he showed her a badge. When they drove off DaRonch realised he was driving the wrong way and when she pointed this out the man tried to handcuff. She screamed and struggled and he accidentally put both handcuffs on the same wrist so she was able to escaped from the car and survive. November 8th 1974: Debra Kent (17) – Despite DaRonch’s escape, Kent vanished after leaving a school play in Bountiful, Utah. The Drama teacher and a student told the police that a man had tried to get them to come to the parking lot to look at a car. Outside the auditorium police found a key that fit the handcuffs from DaRonch’s wrist. According to Bundy, Kent’s body was left near Fairview, Utah. Minimal skeletal remains (one patella) were found but have never been positively identified as Kent’s. January 12th 1975: Caryn Campbell (23) – Campbell disappeared from Wildwood Inn in in Snowmass Village, Colorado. Her naked body was discovered nearby a month later. She had been been beaten around the head with a blunt object. March 15th 1975: Julie Cunningham (26) – Cunningham disappeared on the way to meet a friend for dinner in Vail, Colorado. According to Bundy she was killed and her body buried near Rifle, 90 miles west of Vail. He claimed he returned to visit the body but she has never been found. April 6th 1975: Denise Oliverson (25) – Oliverson was abducted while riding to her parents’ house in Grand Junction, Colorado. According to Bundy her body was dumped into the Colorado River (5 miles west of Grand Junction), but she was never found. May 6th 1975: Lynette Culver (12) – Culver was abducted from Alameda Junior High School in Pocatello, Idaho. According to Bundy he took her to his hotel room where he drowned her then sexually assaulted her body. He then threw her body into Snake River, Idaho but she has never been found. June 28th 1975: Susan Curtis (15) – Disappeared during a youth conference at Brigham Young University in Provo, Utah. According to Bundy her body was buried along a highway near Price Utah but has never been found. In August 1975 Ted Bundy was arrested by a Utah Highway Patrol officer in a Salt Lake City suburb, after he failed to pull over his VW Beetle for a routine traffic stop. The officer (noticing the Beetle’s front passenger seat was missing) searched his car. Bundy had removed the bolts of the passenger car seat, this made his victims impossible to see while travelling in his car. 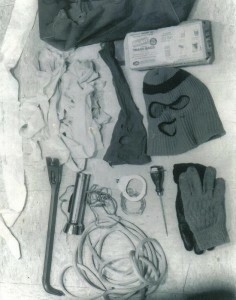 He found a ski mask, a second mask (made out of pantyhose), a crowbar, handcuffs, trash bags, a coil of rope, an ice pick and other items. He initially assumed these to be burglary tools and took Bundy in. However search of Bundy’s apartment police found nothing sufficiently incriminating to hold him and he was released. 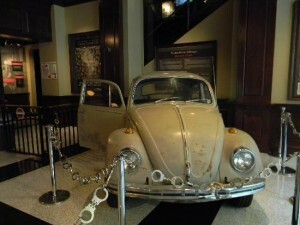 Because of the Volkswagen Beetle connected him to the DaRonch case, they kept Bundy under surveillance and when he sold the Beetle they impounded in and found hairs from 3 murder victims. He was also picked out of a line up by DaRonch as the man who has attacked her and he was charged with aggravated kidnapping and attempted criminal assault. In November 1975, detectives met and compared evidence from 5 different states and were convinced that Bundy was the murderer they were all looking for. However they also agreed they needed more evidence in order to charge him. On February 23rd 1976, Bundy stood trial for the DaRonch kidnapping and on March 1st the judge found him guilty of kidnapping and assault. He was sentenced to 15 years in the Utah State Prison on June 30th. In the next Blog post we will look at his escape, further murders, trials and execution.